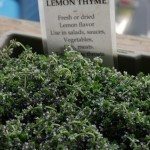 Is the herb Thymus praecox edible? The leaves of this plant are in fact edible and often used in cooking. They are said to have a somewhat garlic flavor.